1 pound ground beef, I have my own ground beef blend, but feel free to use what is available at your local meat market. Break the beef and the sausage into golf-ball sized chunks. In a small bowl combine the 1/2 cup of the ketchup, 1 tablespoon Worcestershire sauce and 2 teaspoons Tabasco sauce and pour over the beef and sausage mix. In the same small bowl, combine the pickle, onion, garlic and parsley, and pour evenly over the beef and sausage. Sprinkle the breadcrumbs over the top and then add the egg and the salt. Gently mix the ingredients together – Don’t over blend to mush! 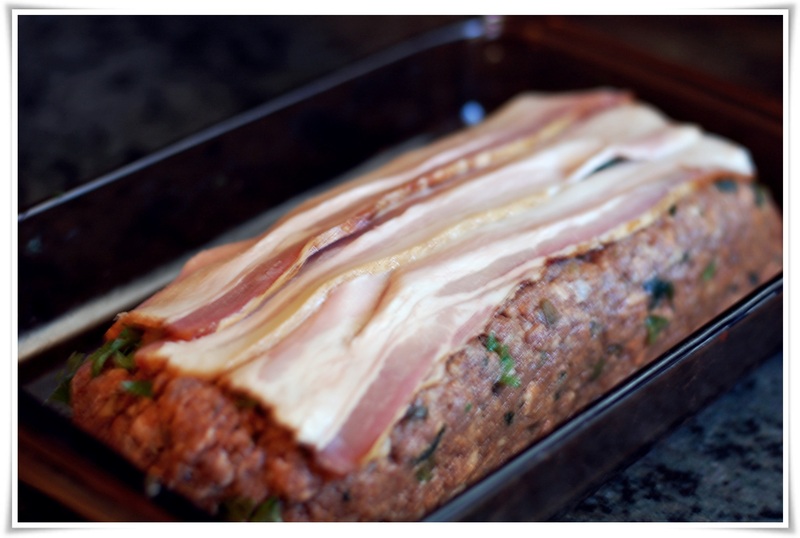 Transfer the mixture to an oiled pan (I have an old ½ sheet pan that works great for free-form meatloaf) and pat it into a loaf shape. Put in the preheated oven and bake for 35 minutes.